Look at your back in the mirror. If your shoulder blades protrude, you might have a shortened (tight) Pectoralis Minor, and a weak Serratus Anterior muscle. The normal position for the shoulder blades is to be flat against your rib cage. Sit in a straight back chair. If you can feel your shoulder blades against the chair, that’s another indication they’re not in their normal position. 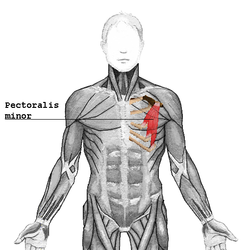 The Pectoralis Minor is a small muscle attached to the top of the shoulder blade, beneath the Pectoralis Major in the front of the chest. There are important back muscles that maintain the normal position of your shoulder blades. One of them is the Serratus Anterior. When the Pectoralis Minor tightens, and the Serratus is weak, the shoulder blade is pulled forward, giving your shoulders a rounded appearance. As your shoulders round forward, your neck and head are misaligned as well. Muscle Imbalance: Strengthening your chest and neglecting to strengthen your back. Or strengthening some back muscles, and neglecting others. Neglecting Stretching: your workout routine should include strengthening and stretching. Inactivity: Tightening of the pectoral muscles, from habitual sitting in a hunched position. 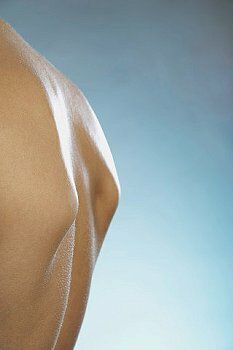 If your shoulder blades protrude, see an orthopedic physician for an evaluation. Your doctor will perform tests, and inform you which muscles are not working properly. He/she will give you corrective exercises to bring the shoulder blades into their normal position. Getting an expert medical opinion will save you time, money and pain. With your doctor’s approval, you can then move ahead with your exercise routine. Posted on August 20, 2012, in Exercise and tagged corrective exercises, Muscle, Pectoralis major muscle, Pectoralis minor muscle, Scapula, Serratus anterior muscle, shoulder health. Bookmark the permalink. Leave a comment.